How does one peer into the mind of an artist, into the deep recesses where creativity and vision abide? What would be visible there? How could it be described and made tangible enough for others to see? The answer is time. Time spent observing what the artist sees, how what she sees affects how she pursues her artistic vision, how the artist lives life day-to-day. Time spent listening to seemingly intangible concepts. Spending enough time that the artist is comfortable working and speaking unselfconsciously while being observed. And then, taking the time to distill all of the observations down to an essence that sheds a sparkling, enticing light on the artistic process; leaving enough unexamined and unspoken so that the wonderful, glorious mystery of the creative process is preserved. 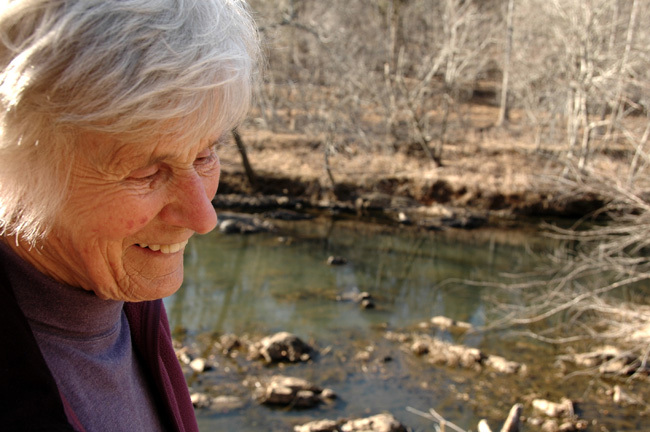 Kenny Dalsheimer’s A Weaverly Path captures a privileged and intimate slice of time observing Silvia Heyden, providing an unprecedented opportunity to see and hear what she experiences during a period of deep involvement with her Muse, the Eno River. 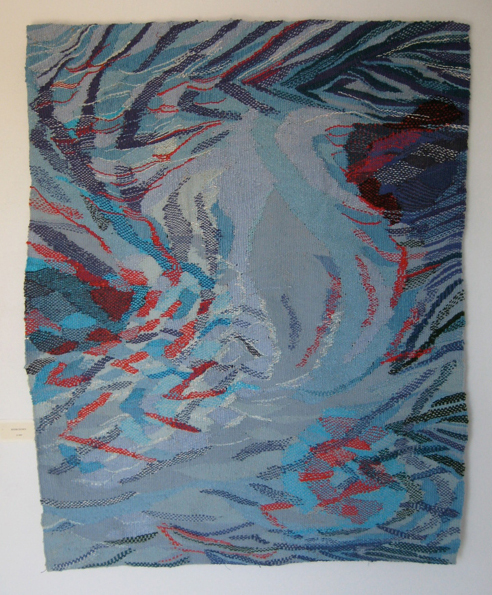 Heyden’s quest is not to weave a representational depiction of the river, but to interpret the river’s fluid patterns, shapes, sounds, and ever-changing nature, to represent its movement and flow with the yarns of her tapestries. Throughout the film, Heyden discusses the challenges and discoveries that mark this journey. The film consists of vignettes carefully woven together, vignettes that capture moments of time throughout the year Dalsheimer spent working with Heyden. 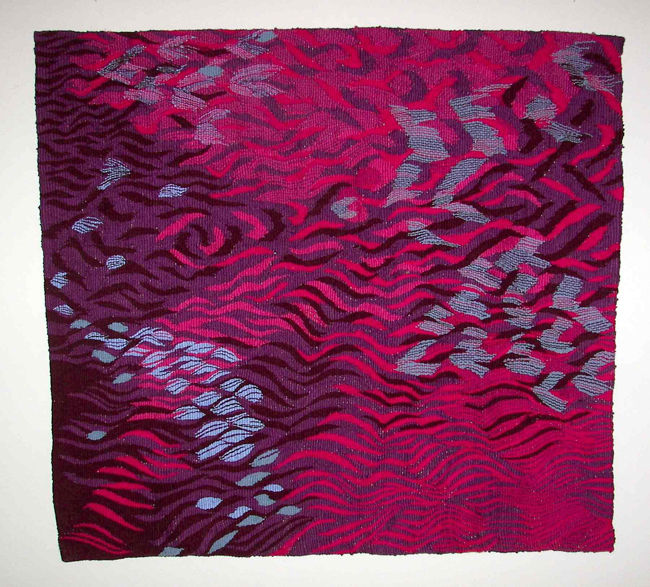 The flow of the film mirrors the visual dynamics of a Heyden tapestry… full of movement and changing colors, never still, changing direction, yet all the while maintaining a unifying undercurrent. 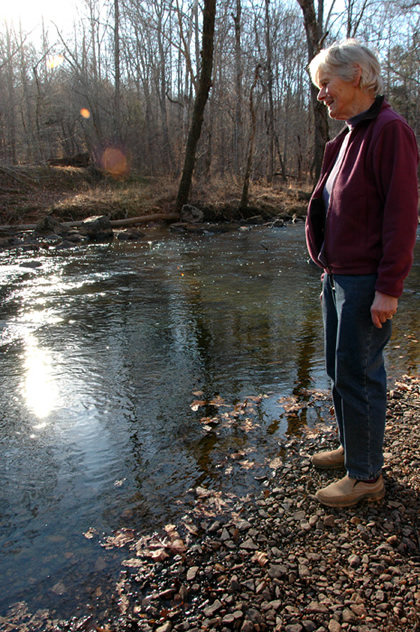 The coalescing force both in the film and in Heyden’s work is the Eno River. Heyden’s visits to the river mark the seasons as she fully experiences it by hiking, sketching, and immersing herself in its refreshing pools. Each activity feeds her understanding of the river’s nuances, and each visit finds her as amazed and excited as if it were the first, as she constantly puzzles out what she is endeavoring to capture in her work. The carefully chosen music flows through the cinematography like a constant current, either setting the tone or creating a subtle accompaniment, at times lively, at times contemplative. Heyden’s voice provides the narrative. 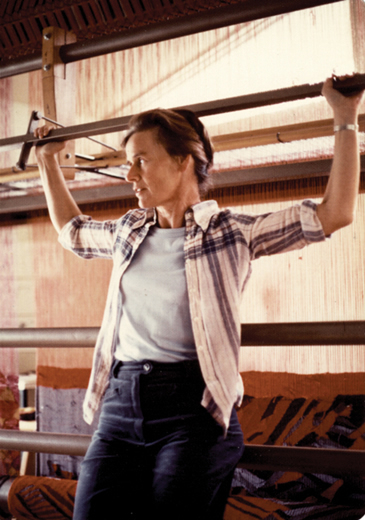 Brief retrospectives of her childhood, young adulthood, and the beginnings of her career as an artist are included in the film, which will afford viewers who may not have read her 1998 book, The Making of Modern Tapestry, insight into the events that have shaped her as an artist. Descriptions of her childhood in Switzerland, young adulthood in Berlin after the war in the mid-50’s, and the political events of 1961 during the raising of the Berlin Wall under the Communist regime which resulted in the design and weaving of one of Heyden’s earlier works, In Tyrannos, portray situations and events that many people could not comprehend today. Heyden also recounts her experiences studying under Johannes Itten and Elsi Giauque in the School of Design in Zürich from 1948 to 1953. 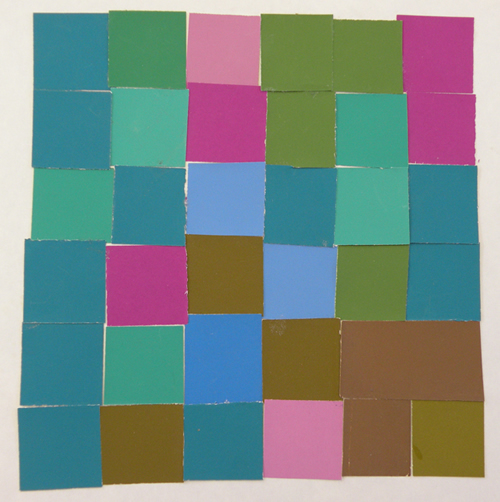 Johannes Itten, the school’s director, required all students to spend their first year taking his courses in Design and Form, following the Bauhaus tradition and providing the underlying structure for the remainder of what they chose to study. 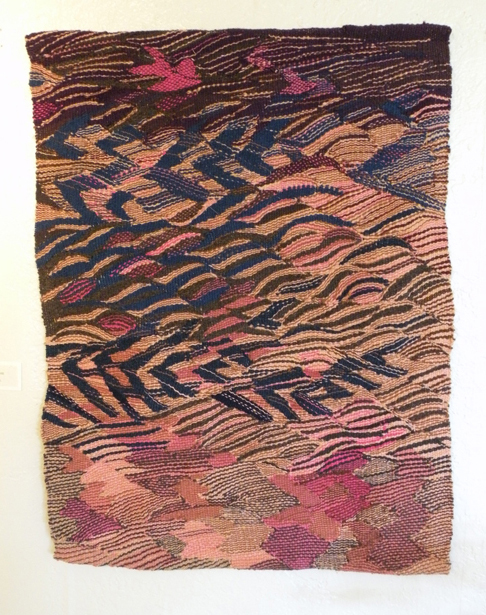 She identifies Elsi Giauque, “the lady of textiles”, as her “real” teacher during her later studies; it was under Giauque’s tutelage that Heyden discovered her desire to become a tapestry weaver. 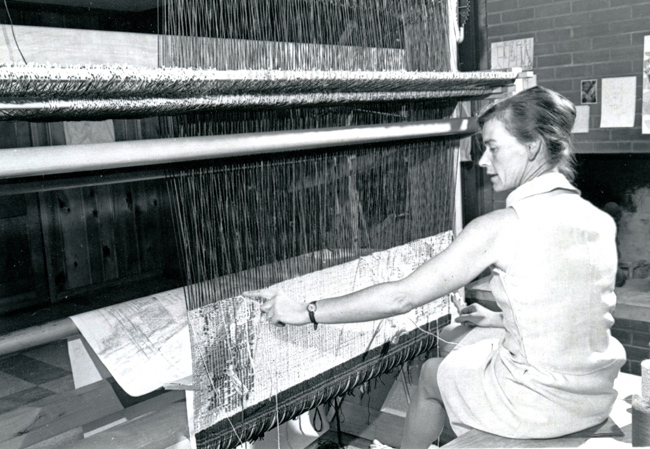 Later, as Heyden married and she and her husband began to raise their family, her weaving became an integral part of their lives together. 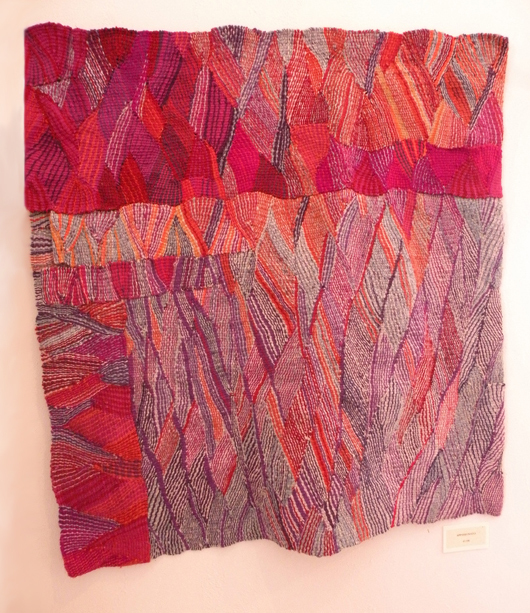 Heyden expresses her current philosophy in regard to tapestry weaving as having expanded greatly from what she originally described in her book, stating that she expects it to continue changing as long as she is alive and able to weave. 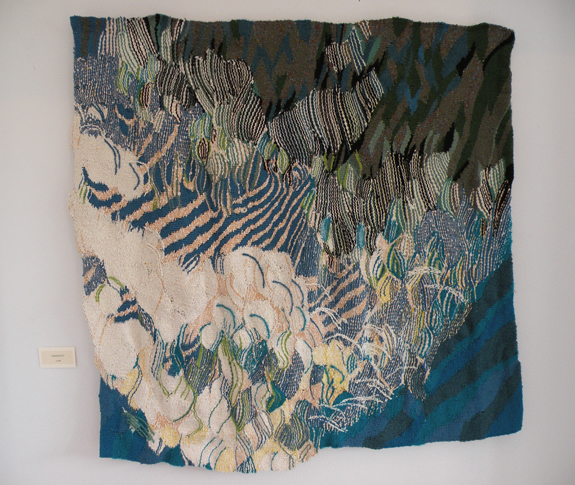 She believes strongly that tapestry exists as its own art form which should not be compared to paintings or created from drawings or photographs, but which should instead evolve by looking at the world through “weaver’s eyes”. 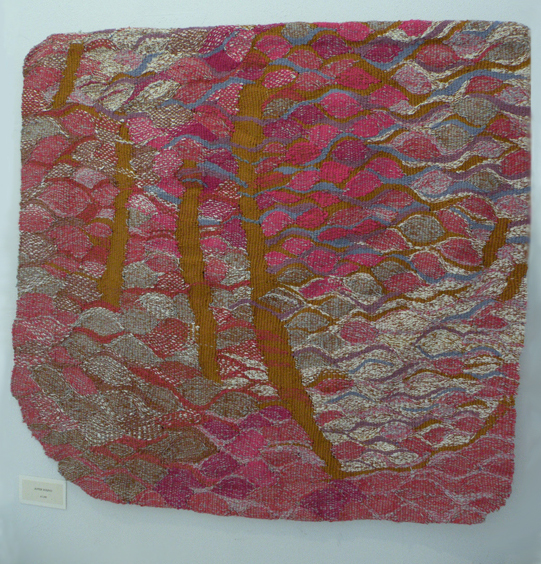 Tapestry designs should be composed using motifs that communicate movement, unlike other art forms such as painting, and she describes her creative process as a reversal – not weaving as she draws but instead drawing as she weaves, filtering out anything “unweaveable”. 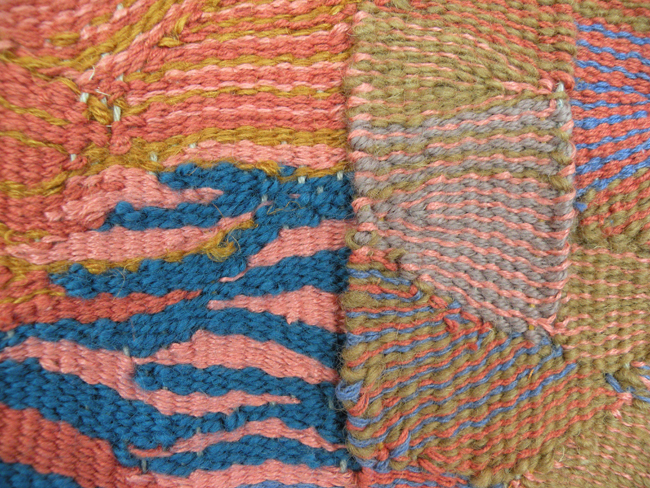 The technical realities of weaving are not impediments, but are challenges that stimulate creativity. 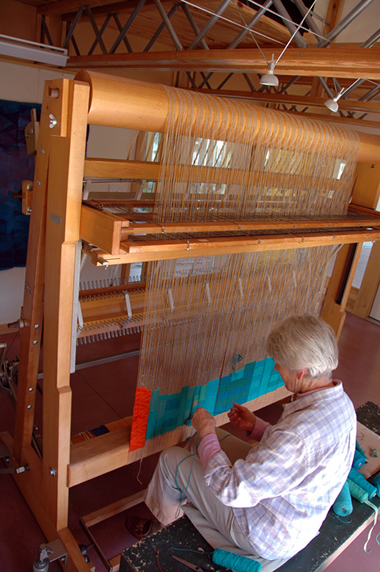 Heyden exudes enthusiastic excitement as each new tapestry is cut from the loom. That enthusiasm is equally strong when she visits her earlier works in the scene at Wake Forest University’s Scale Art Center. Here she views her massive tapestries Passacaglia and Chaconne, originally commissioned in 1977 by R.J. Reynolds Industries and later donated to the University. Both works embody the importance music holds in her life, yet she is adamant that she is not weaving music but is weaving the colors and patterns she sees when she hears music, something made possible because she has synesthesia, a neurologically based condition in which stimulation of one sensory or cognitive pathway leads to automatic, involuntary experiences in a second sensory or cognitive pathway. 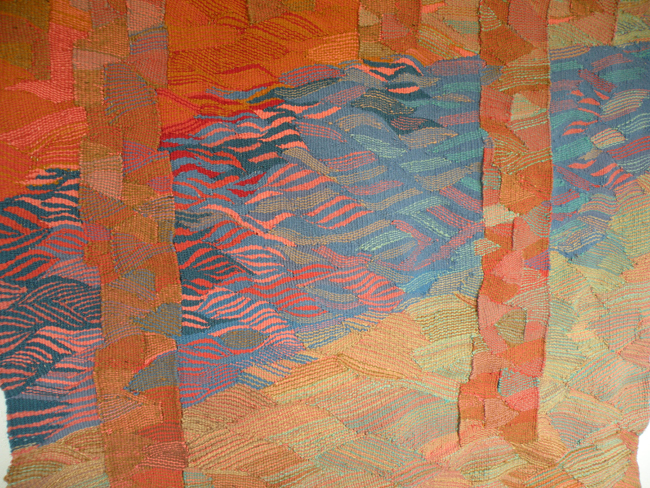 The opening reception of Heyden’s solo exhibit of her Eno River Tapestries, held at the Horace Williams House in Chapel Hill, North Carolina, is a visual swirling cacophony. 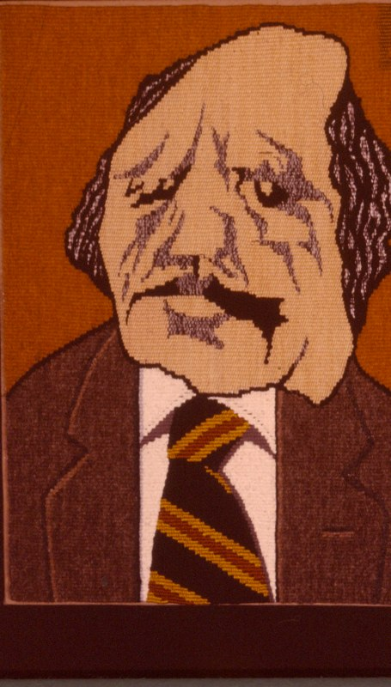 The vibrant tapestries displayed together radiate a dynamic and tangible energy even as one views them on film. Dalsheimer successfully captures the entire impact of the exhibit, from the excitement of the guests and Heyden herself as she discusses her work, to the beauty of the tapestries, seen from both a distance and in close ups that capture the hues, textures, and weave structures. 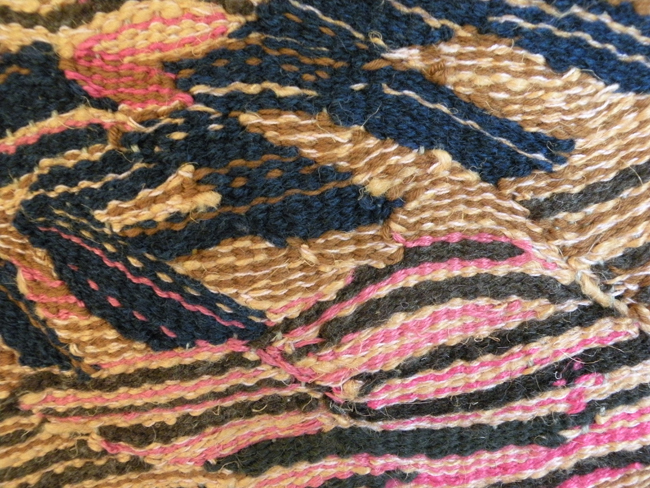 As anyone who has attempted to photograph textiles well knows, this is not an easily accomplished feat. 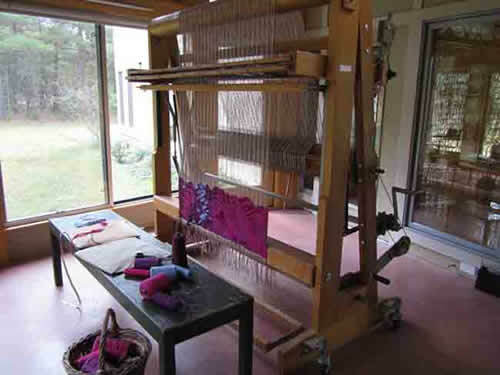 Within the spare beauty of her home, built specifically to accommodate summer and winter studio areas, Heyden’s large loom is the centerpiece. 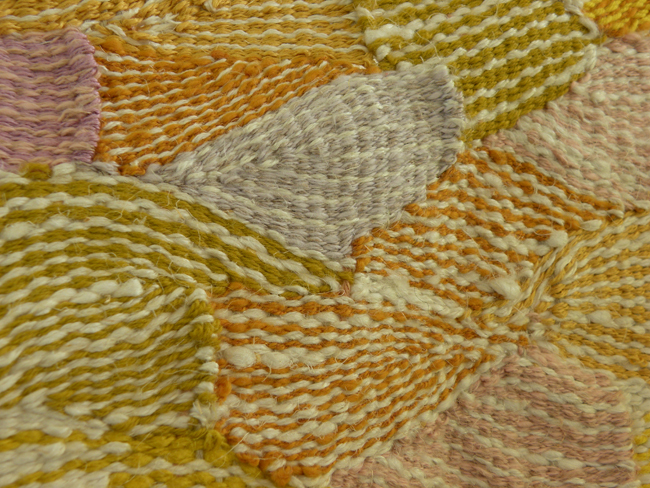 Her earlier woven and crocheted works and more current tapestries soften the space. 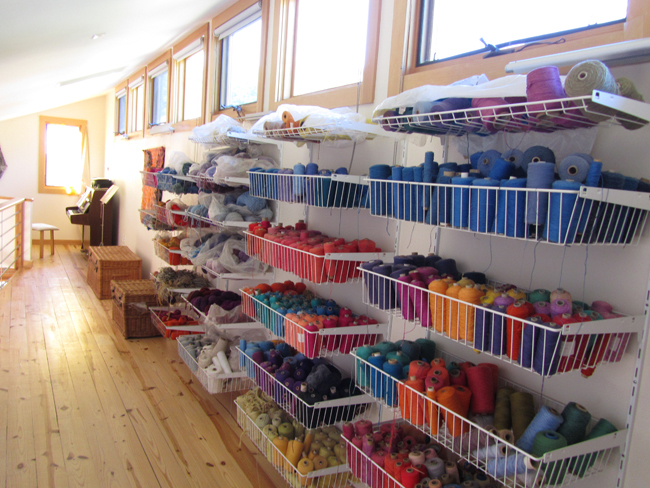 Throughout the film, Heyden works in different stages of the weaving process: designing; warping; choosing yarns from her enviably large stash of Swedish linens and wools; weaving; cutting off and contemplating finished tapestries. She also welcomes into her home a small number of weavers from the regional group, Tapestry Weavers South, who listen intently and scribble notes furiously as she discusses her philosophy of tapestry weaving. 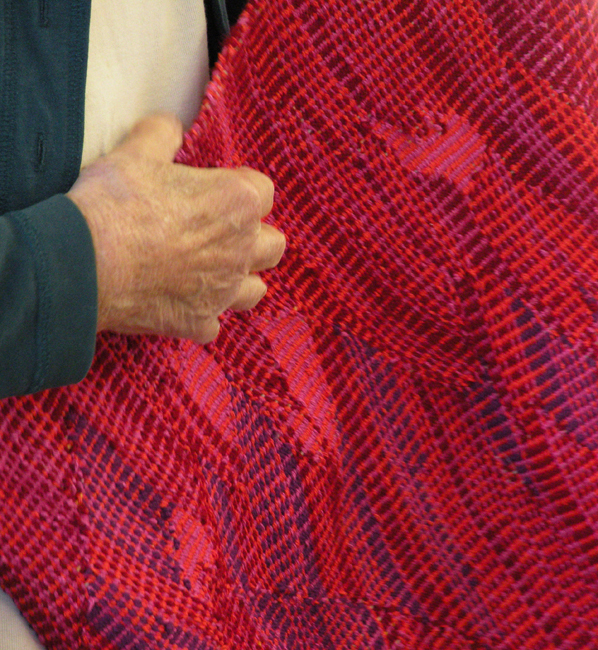 They eagerly examine several of her recent works, and observe her weaving a current commission. Dalsheimer’s cinematography is wonderfully vibrant and clear, accurately representing both the sometimes shocking colors of Heyden’s work and the subtle, tranquil, and contemplative colors of the river scenes through each season. 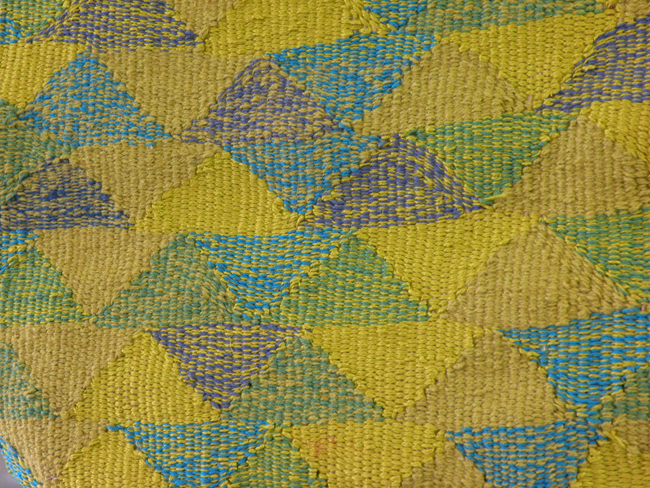 The weaving scenes are luscious, so closely filmed that one can see the hairs and feel the coarseness of the linen warp, watch the colors vibrate as they are woven in, perceive the faint scrunch of the weft as it passes through the warp, and hear the familiar squeaks and clatter of harnesses moving to and fro. 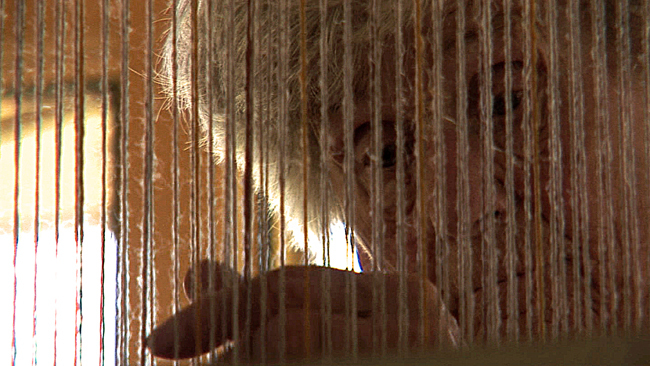 Dalsheimer chose to film a few weaving scenes in black & white, giving the viewer’s eye a rest from the vibrancy of the yarns and directing awareness to the dance between warp and weft, focusing attention on the beautiful grace of hands that have made these movements thousands of times over decades of weaving. The power of observation over time. 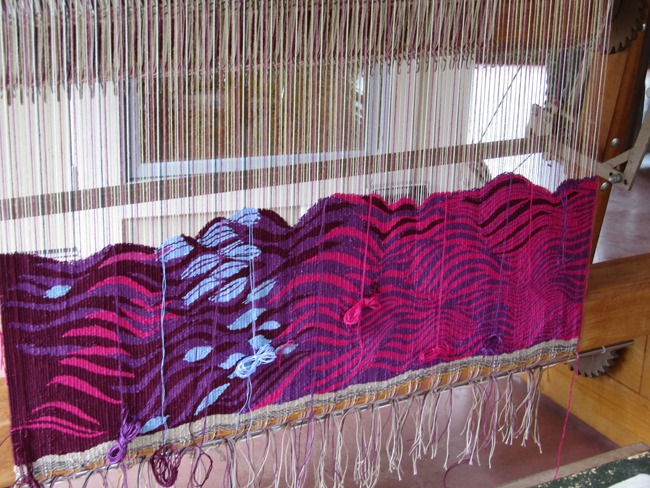 The time Silvia Heyden takes to observe the Eno, to understand its pulses, rhythms, and nuances leads her to a high point in her pursuit of using forms and motifs to represent fluidity in her weaving. 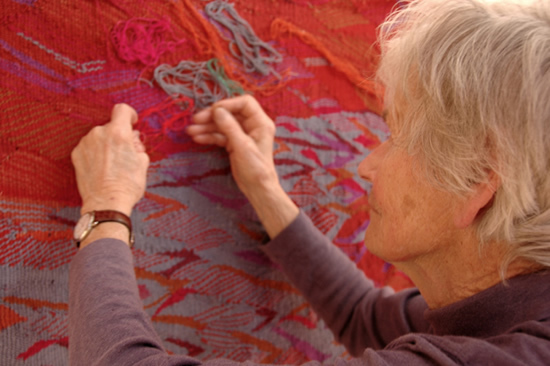 The time Kenny Dalsheimer took to observe Heyden in her element, to understand the medium of tapestry and to not rush in the crafting of this film have resulted in a rendering of the creative process that is inspiring and thought provoking. As of this writing, A Weaverly Path is currently being submitted to US and International film festivals. Plans are underway to sell DVD’s and to make the film available in the fall of 2011 for public screenings and community events. 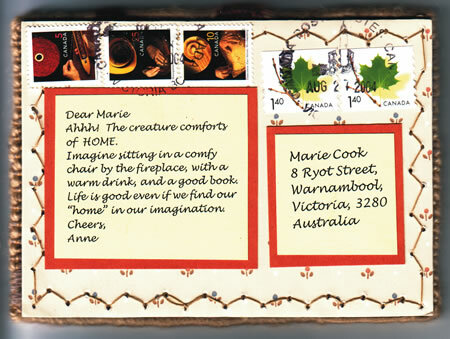 Email info@aweaverlypath.com if you wish to be contacted when the film becomes available. View a preview trailer of the film here: http://aweaverlypath.com/see-the-film/. 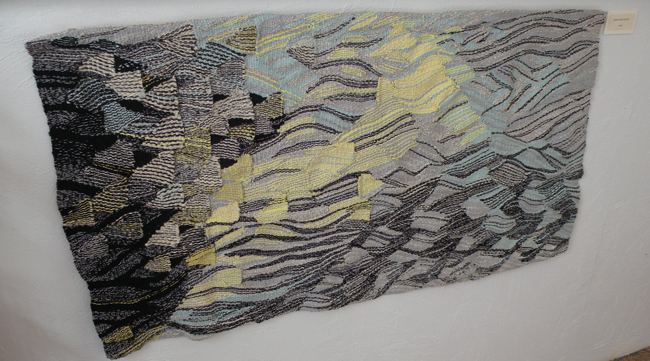 Heyden’s book, The Making of Modern Tapestry, is still available for sale.